What is the term for a feature that allows an organism to survive better in its environment? are not found in ancient organisms. were useful to their ancestors. do not fill gaps in the fossil record. Which of the following lists the four main principles of the theory of natural selection? What does being in Hardy-Weinberg equilibrium mean for a population? The population is evolving very rapidly. Gene flow would occur, but slowly. very small, have random mating, no gene flow, no mutations, no natural selection. very large, have random mating, high gene flow, many mutations, natural selection. small, have nonrandom mating, no gene flow, many mutations, no natural selection. very large, have random mating, no gene flow, no mutations, no natural selection. Assuming that there are only two alleles at a given locus, if the frequency of one allele is 0.6, what is the frequency of the other allele? If a population with two alleles is at Hardy–Weinberg equilibrium and the frequency of one allele (p) is 0.7, what is the heterozygote frequency? For questions #16-19 use the scenario below to help answer. A biologist spent many years researching the rate of evolutionary change in the finch populations of a group of islands. 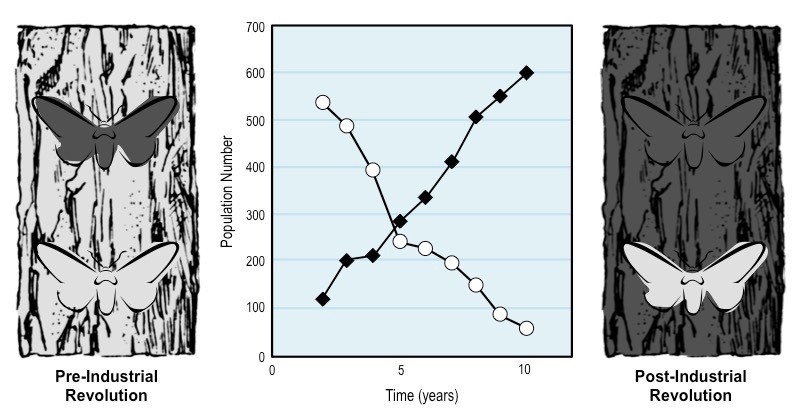 It was determined that the average beak size (both length and mass) of finches in a certain population increased dramatically during an intense drought between 1981 and 1987. During the drought, there was a reduction in the number of plants producing thin-walled seeds. Which of the following procedures was most likely followed to determine the change in beak size? A few finches were trapped in 1981 and again in 1987, and their beak sizes were compared. The beak size in fifteen finches was measured in 1987, and the beak size in the original finches was determined by estimation. The beak size in a large number of finches was measured every year from 1981 to 1987. Finches were captured and bred in 1981, and the beak size of the offspring was measured. Which of the following statements might best explain the increase in average beak size in the finch population during the drought? Finches with bigger beaks can attack and kill finches with smaller beaks. Finches with bigger beaks possess more powerful flight muscles and are able to find more food. Finches that crack large seeds develop larger beaks over time. Which of the following best describes the mechanism behind the change in beak size in the finch population? The biologist discovered that from 1988 to 1993, the average beak size declined to pre-1981 levels. The reversal in beak size from 1988 to 1993 was most likely related to which of the following events? Explain what the terms ( p2, 2pq, and q2 ) represent in the population of fruit flies. Describe one condition that is necessary for the population to be in equilibrium. In the reading above, what is the meaning of the term "selective advantage"? Explain what environmental factor influenced the change in color of the peppered moth. 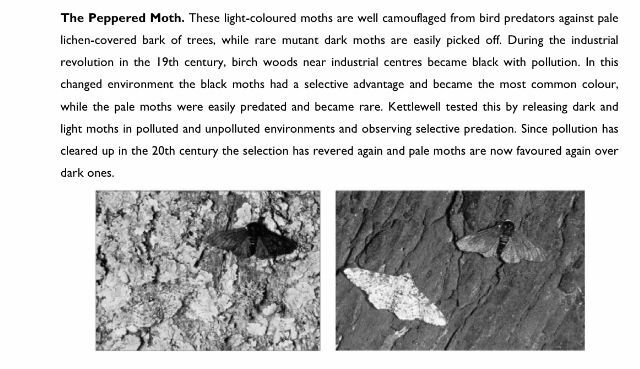 Describe Kettlewell's experiment with the peppered moths. Describe the trend of the peppered moth using the graph above. Based on the graph above, in which year were both colored moths equal? If a population that contains 16% homozygous recessive individuals (blue eyes), and 84% individuals with brown eyes (homozygous dominant and heterozygotes), what is the frequency of the dominant allele (p) in the population?